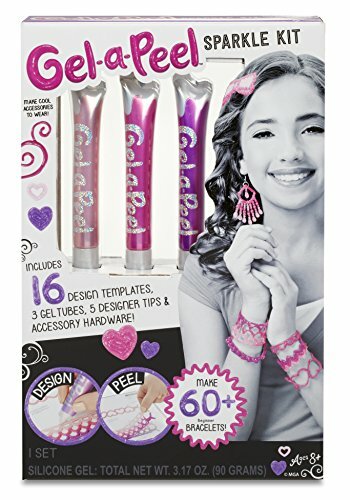 Gel-A-Peel is a fun, creative and cool kit that allows you to design and make your own jewellery craft. It's a unique way for children to design and make their very own wearable accessories. Available in a wide variety of colours and including glitter effects, Gel-A-Peel is perfect for kids that love art and crafting. It keeps you occupied for a good couple of hours, as you concentrate on designing and creating your piece. The best part is, you not only make your piece, you get to wear it afterwards. And, you can make all sorts of things, from, necklaces, bracelets, earrings, hair clips, brooches - you can use it to enhance other items, like your hair band, you can add some cool cat ears, or make your purse cool by adding a keyring make with Gel-A-Peel. 3 Gel tubes: neon orange, neon, pink, and neon yellow. Gel-A-Peel is simple to use. The gel squeezes out easily enough, I did find I had to stop and clean the nozzle a few times, to keep the gel smooth as we squeezed. You either follow the design using the template or if you prefer, go freestyle. You create your design, using one colour first, leaving it to part dry for 15 minutes, then adding another colour and so on. You then leave it for a couple of hours to dry fully, although, we did find it was best to leave to dry overnight. Don't expect your finished design to look as perfect as it does on the box, however, it will be uniquely yours and therefore, it will look and be better! Aimed at 8+ years, It's a great gift idea. For Halloween, Gel-a-Peel has added a couple of free patterns for you to download from their official website. We followed the template and made a bracelet, we also went freestyle and made some pumpkin earrings, for Halloween tomorrow.